Though I have made the same recipe earlier as NO Onion and No Garlic using Quinoa, paneer, and potato as "Quinoa Paneer Bread Rolls" I have not thought about making it only with aloo since I was always stuck to the idea of making something healthy:). When I visited my friend Neha's house, she made yummy bread rolls with potato stuffing. I loved them and asked her the recipe. She said it is pretty simple and asked me to boil potatoes and add the spice powers stuff within bread and fry. 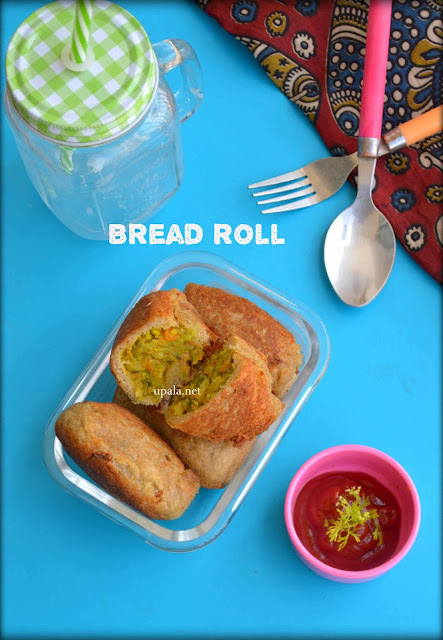 I wanted to try the same recipe, but I had a few leftover stuffing of my "mixed veg paratha" so tried a quick bread roll with this stuffing and it was so delicious that I get to taste only one bite:). This veg stuffing is versatile and can be used to create a variety of dishes. 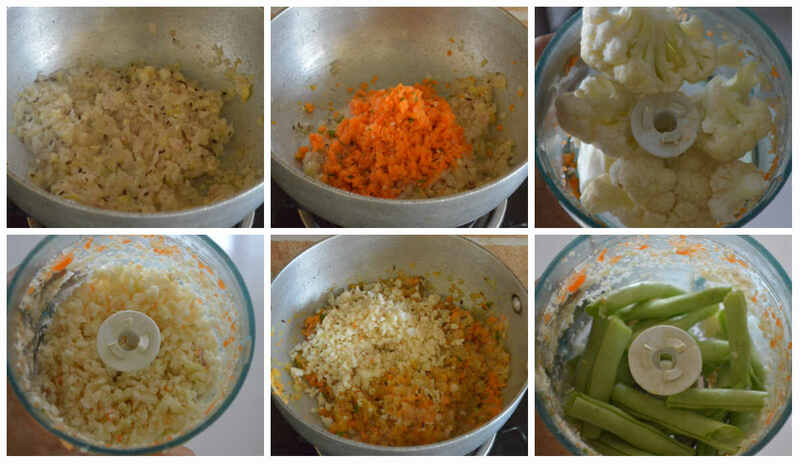 Prepare this stuffing in bulk and keep it in the fridge to use it for 2-3 days. You can make bread rolls, paratha, cutlets and even dip it in besan paste and fry to make bondas similar to aloo bonda. For the stuffing, other than potato and onions, I have added beans, capsicum, peas, carrot, and cauliflower. You can also add grated kohlrabi, cabbage, and beetroot. 3) Finely chop onion, ginger, and garlic and set aside. 4) Heat oil in a kadai/wok and add cumin seeds to crackle. 5) Add the finely chopped onion mixture to oil and leave it to fry in low flame with occasional stirring. In the meant time, you can finely chop carrots and green chillies. 6) Once, onions turn light brown add the carrots and leave it to fry along with onion mixture. 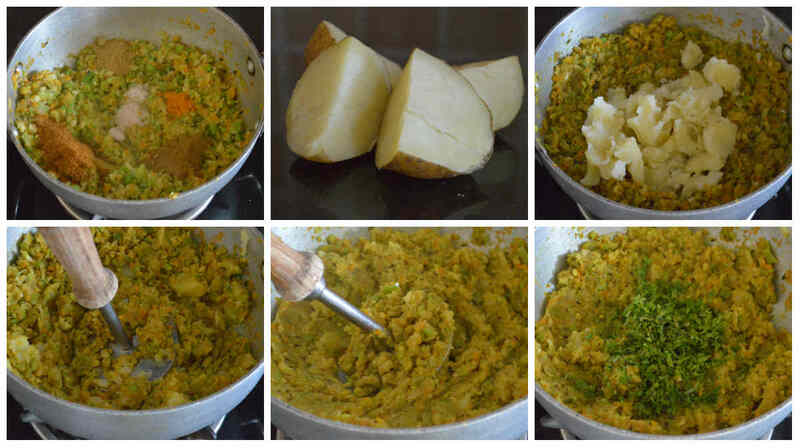 7) Next finely chop, cauliflower and add it to kadai and mix well. 8) Finely chop beans, capsicum and green peas and drop them in kadai. Mix well and leave it to cook in low flame with occasional stirring. 9) After about 5 minutes of cooking the veggies, add all teh spice powers and mix well. 10) Leave them to cook in low flame for another 5 minutes so that the masalas blend well with veggies. 11) Next, add mashed potatoes and mix well. 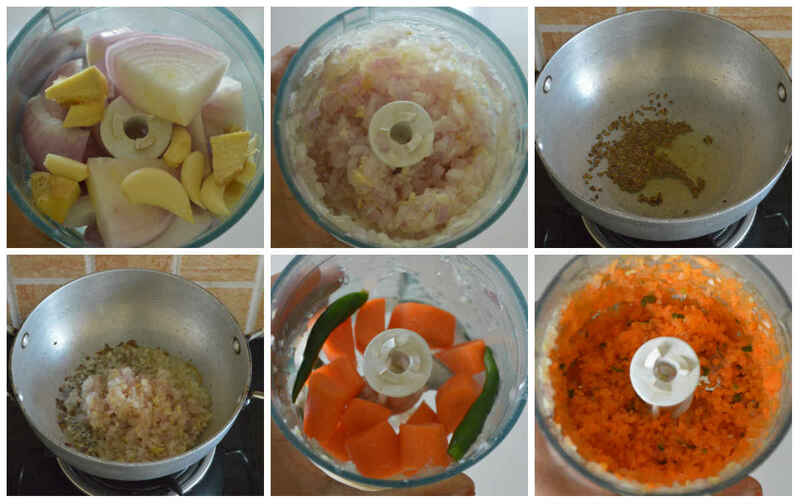 12) At this stage, you can use a pav bhaji masher to mash the veggies. It helps the potatoes to mix well with other veggies. 13) Add finely chopped coriander and switch off the flame. Mix them well. 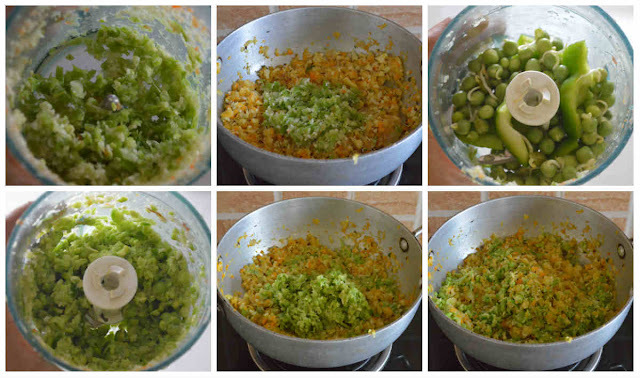 14) Squeeze in the lemon juice and mix well. Our stuffing is ready and let it cool down for few minutes before we start making the bread rolls. 15) After the stuffing cools completely, heat oil in a wok/kadai. 16) Take a slice of bread and make a quick dip in a bowl of water. 17) Press them between your palms to squeeze out the water completely. 18) Take some stuffing and make it a ball shape and place it on the bread. 19) Close the bread slowly and cover the stuffing completely. Slowly shape the bread roll and drop it in the oil. 20) Leave it to cook in medium flame and once one side is cooked slowly roll it to cook on other sides. Drop these rolls in batches in hot oil and shallow fry them till they turn the golden color. Instead of shallow fry, you can even deep fry the bread roll in hot oil. Yummy bread rolls are ready to be served with green chutney or tomato ketchup. 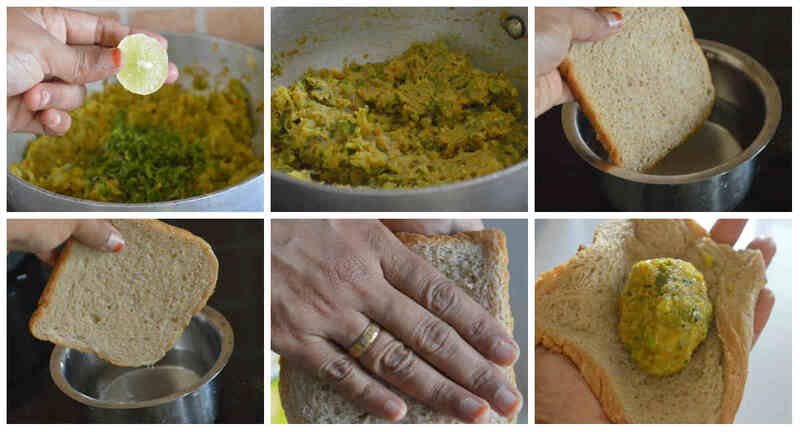 1) I have used brown bread, you can even use milk bread or the sandwich bread. 2) You can always adjust the spice powders as per your convenience and availability such as replacing lemon juice with amchur powder, Garam masala with kitchen king or chole masala, green chilies with red chili powder. 3) Add paneer or cheese along with veggies to create a yummy variation. 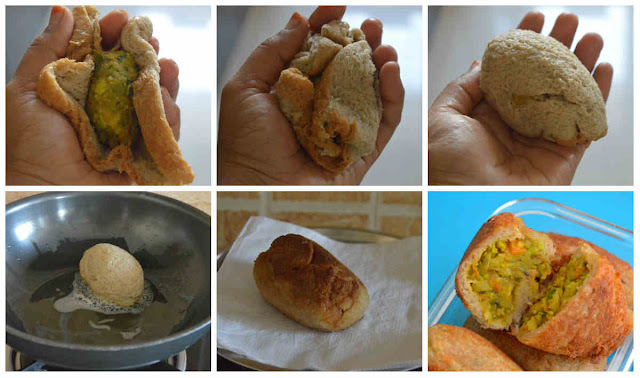 4) If you want to prepare this Bread roll as No onion and NO garlic recipe still it taste so delicious. Just avoid onions and garlic and add rest of the veggies that's it:). 1) It is really important that you need to serve them hot so better avoid preparing them in advance. You can prepare the stuffing in advance but not the frying part. 2) I have not trimmed the edges of the bread because I don't want to waste them. I was able to make a good shape with the corners on, the taste also didn't change. If you feel difficult to get the shape then you can trim the edges. 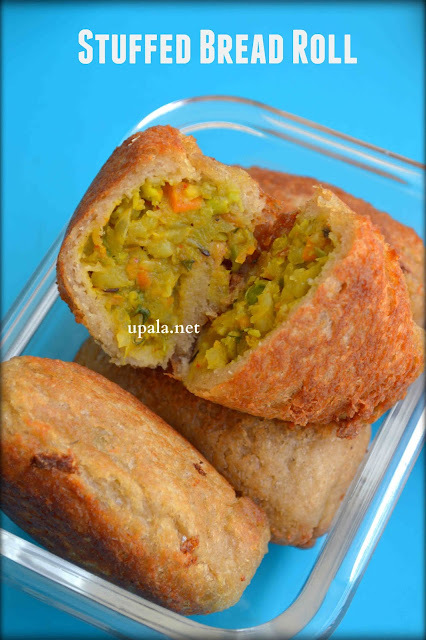 I have made bread roll many time but now I will surely try with mix veg filling. Well told recipe.